There have been reports that the website of Canadian bobsledder Justin Kripps is being blocked in Sochi. Some reports have indicated that the site may have been blocked due to images which had been posted in January 2014. This Citizen Lab blog post confirms that the website is blocked, however this is likely the result of collateral filtering and not a deliberate attempt to target the bobsledder’s site. Tests conducted for accessibility of the site: http://justinkripps.ca on publicly available HTTP proxies across Russia confirm that this URL is blocked. We have seen blockpages returned for this website on two Autonomous System (AS): OJSC Rostelecom (AS3239) and a private company AS whose sole peer is OJSC Rostelecom (AS12389), which are based in Moscow and Buryatia, Russia, respectively. Rostelecom is the official provider of the telecommunications infrastructure for the Olympic games in Sochi. Dear users, We apologize, but access to the requested resource is limited. Access is limited by court order or otherwise established by the legislation of the Russian Federation. 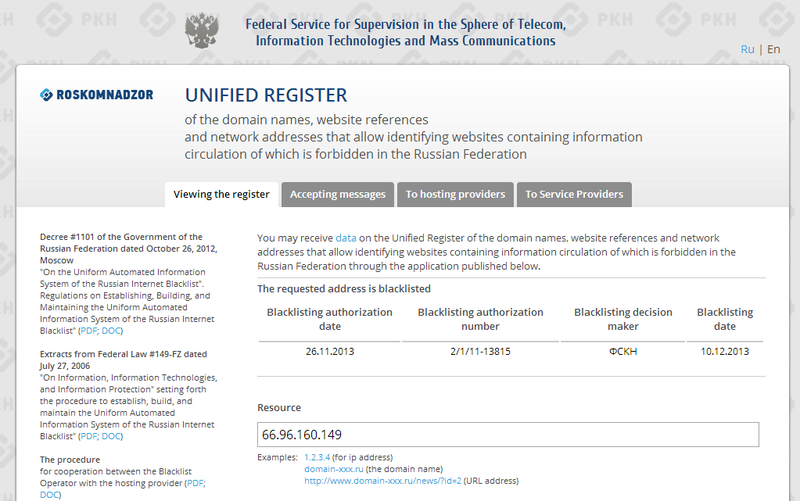 Network address, which identifies the site on the “Internet”, included in the Unified Registry of domain names, indexes pages sites network “Internet” and the network address for the identification of sites in the “Internet”, containing information dissemination in the Russian Federation is prohibited. 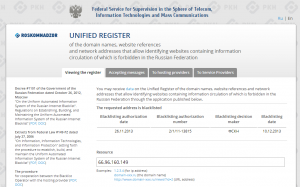 Check availability of the network address in the Unified Register in the section “Viewing the Registry” online www.zapret-info.gov.ru . Network address, which identifies the site on the “Internet”, included in the registry of domain names, indexes pages of sites in the “Internet” and the network address for the identification of sites in the “Internet”, containing information disseminated in violation of the exclusive rights. 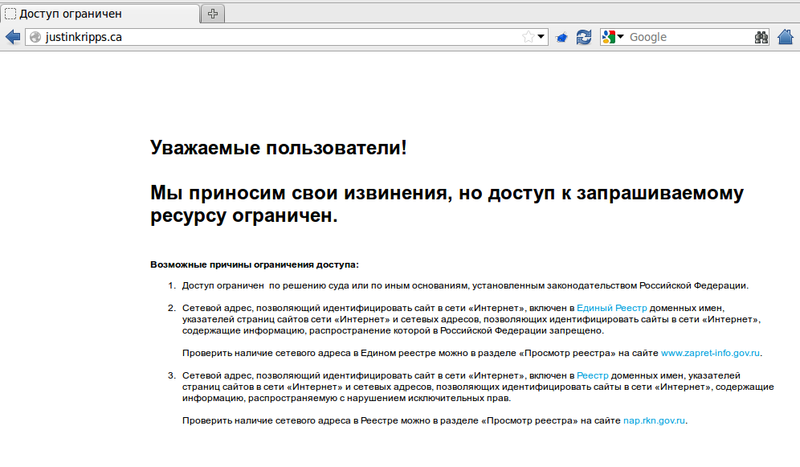 Check network address in the Registry, you can see “Viewing the Registry” online nap.rkn.gov.ru . The blockpage is consistent with reports of blocked content on this ISP. ISPs in Russia are required to block content which is deemed to be harmful to children. The website justinkripps.ca is hosted on the IP address 66.96.160.149 by U.S. based hosting provider Endurance International Group. In addition to this site, thousands of additional domains are also hosted at this same IP address. Tests on the same Russia-based proxies show that all of these URLs are also blocked with this same blockpage. For example, the site catchthetrout.ca which is a “Rural Public Transit Service in Ontario” was also found to be blocked on the same proxies with the same message, although it is unlikely that such a local website would be targeted by Russian authorities. The ‘blacklisting decision maker’ is listed as ‘ФСКН’ (‘FDCS’) or the Federal Drug Control Service of Russia. The website of Justin Kripps (justinkripps.ca) is not listed on this blacklist. We were not able to identify a domain also hosted on this IP which is listed on this blacklist. The HTML source of the blockpages and content returned from the University of Toronto network is available here. Citizen Lab researchers confirmed today that the website justinkripps.ca is now accessible from Russia on the ISPs Rostelecom, Dom, TTK, and MTC. We tested the accessibility to the website after learning that the website has changed its IP address. This blocking was a problem that was solved largely due to the public attention paid to this particular case. There are still thousands of domain names that are residing on the previous IP address they are likely still being blocked in Russia. This case highlights some key challenges that collateral filtering presents. For one, this type of blocking unfairly targets content that is completely unrelated to the intended block page. Further, moving content from one IP address to another might involve unexpected costs and inconveniences that may prohibit smaller organizations from moving their content. There is also a lack of awareness that the content is being blocked in a country, and when discovered can easily be misinterpreted, as this story highlights. Finally it creates a patchwork on the Internet addressing space that will be guarantee any future content posted on a blocked IP address will be end up being blocked to a segment of a population without any recourse.